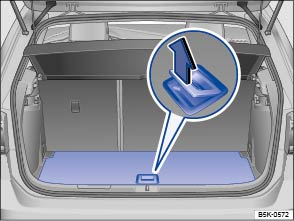 The variable luggage compartment floor is height-adjustable. Remove the luggage compartment net if necessary . To open, lift the handle in the luggage compartment floor in the direction of the arrow and fold the floor upwards until it is held in position by the side restraints (arrows) . 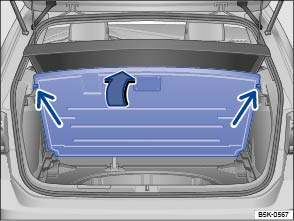 To close, guide the luggage compartment cover downwards into position. Lift the luggage compartment floor and pull it rearwards out of the guides on the sides of the luggage compartment. Insert the luggage compartment floor into the guides at the required height and push it forwards as far as it will go. Place the luggage compartment floor on the floor covering. Never drop the luggage compartment floor, but rather guide it back down. The trims or the luggage compartment floor could be damaged. If you intend to stow the uninstalled luggage compartment cover under the variable luggage compartment floor, insert the luggage compartment floor into the upper guides.